It’s that time of the year again – where a host of expectant teens await their school exam results! Whether you’re happy or not with your results, it can be a confusing time. Have you made the right university choices? Are you reconsidering your options? Are your results not what you expected? There’s a lot to think about. DYW Glasgow have launched a campaign to celebrate the broad range of career paths that you can take once you leave school. So just remember, there is no perfect path and there are heaps of different options available to you. 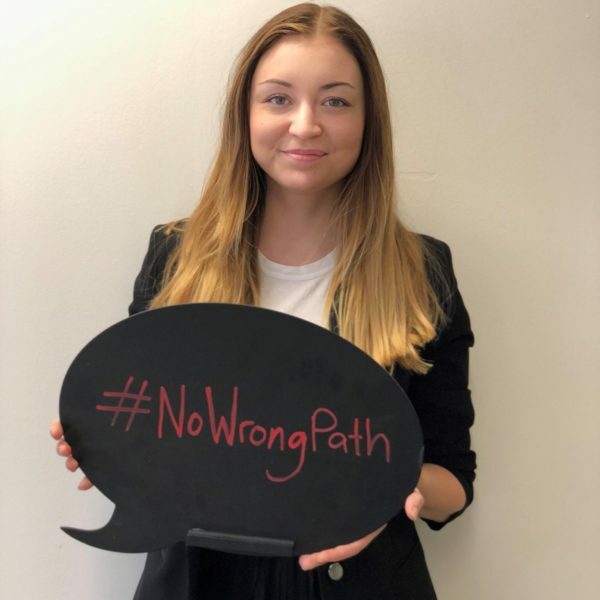 For inspiration, why not take a look at what others are sharing across social media with #nowrongpath? It got us thinking. How did we all get to where we are today? From fashion branders to photography students, we’re a diverse bunch here at Whitewall. 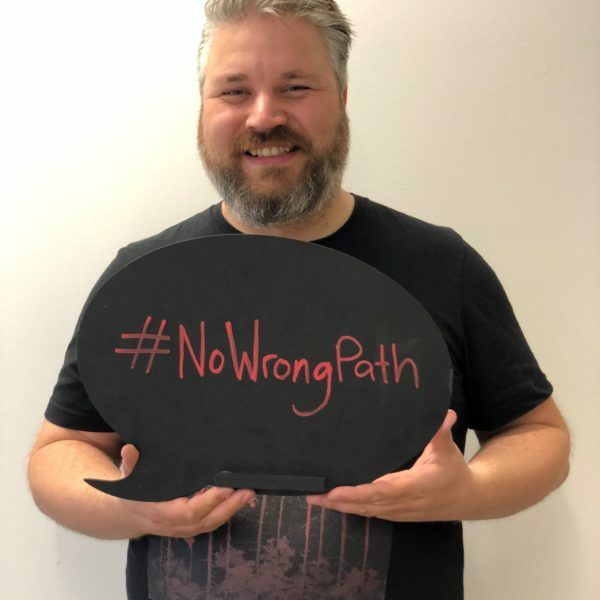 So read a few of our stories, maybe pick up a pearl of wisdom or two, and you’ll see for yourself – there really is #nowrongpath. What did you think you were going to be when you were younger? What did you train or study to do? I studied International Fashion Branding at Glasgow Caledonian University. Originally, I wanted to study fashion and eventually go into fashion buying, but once I started I found my love of marketing. How did you get to Whitewall? When I came out of university I started working at House of Fraser on the Kate Spade concession. I did this for about six months until I realised I wanted to try and get a job in marketing. Then I found Whitewall – and here I am! I support the marketing account managers on their accounts as well as picking up tasks on the digital side. I love my role as I can see a marketing campaign come to fruition from start to finish, while building my digital skillset at the same time. Research what’s out there before throwing yourself into something you won’t be happy doing. I didn’t know Fashion Branding was an option until I looked into it – then I knew it was what I wanted to do. Be calm and consider all options. I really didn’t have a strong idea of what I wanted to be, only that I loved books, reading and writing and wanted to do as much of that as possible. I studied English Literature and Film and Television Studies at the University of Glasgow. I remember how difficult it was to choose between so many courses and just went with my gut instinct. Although it might not seem not directly related to what I do now, it gave me so many skills that are perfect for my role. Going to university isn’t for everyone, but I’m so glad I did as it gave me the opportunity to study abroad in Canada. I completed two internships before landing my lovely role here at Whitewall. With a few months’ marketing experience under my belt, I felt ready to tackle digital marketing full-time. All my work is digital, although I love working with the marketing team to create campaigns that have impact. We work on so many different elements such as social media strategies, emailer campaigns, copywriting, web content and monthly analytics. Every day is different, which I think is the best part about the role. It’s only easy for me to say in hindsight but the best advice I could give is not to panic. Look into all the options available to you, think about your skills and personality, and then finally go with your gut. And if it ends up being the wrong decision? That’s ok too! There’s always the option to start again. My earliest memory of wanting to be something was an inventor. I used to dream about making all sorts of things and my lifelong love of LEGO started around this age. In truth, though, I never had much thought beyond the fantasy of what I wanted to be – and that carried through into my teen and adult life. I went through secondary school with little idea of what I wanted to do afterwards and settled on graphic design due to an aptitude for art and English. I went to Aberdeen College to tackle an HND but the lure of a big city when I had grown up in the country proved too attractive, and I spent more time enjoying myself than going to class. I ultimately dropped out and ended up working in Halfords for six years. While it was a fun time in my life (living with friends and enjoying myself), I was very unfulfilled in that job and eventually built up the confidence to leave Aberdeen. I was made redundant from a wedding magazine due to the company relocating and spent a couple of months unemployed, picking up bits and pieces of work where I could. My first relatively long-term temping job was at Whitewall and, though I was originally put forward to fill a social media position, the account consultant at the temp agency gave me some advice I will always remember – ‘Do everything you can to impress them’. I took her advice and, after a few days here, I was offering to help with retouching and anything they would let me do. Obviously, it paid off. In my current role I cover every aspect of design from concepts through to artworking. We are a small team so everyone needs to be proficient in the key areas of design. While I am largely self-taught, with only Photoshop and InDesign training, I have learned a massive amount simply by doing things. Experience is the key in any job and formal training can only take you so far. Don’t worry about where you’re going to end up. I feel more than ever that the pressure to make massive life changing choices falls on us at too young an age. I have often thought about what I would do differently if I had the chance to do it all again, and while my choices were not necessarily always sensible productive ones, they landed me here with a lovely wife and family, a great and fulfilling job and a strong sense of achievement and world experience. In truth the only thing I would change about the path I’ve taken is that I wouldn’t beat myself up as much as I have for the perceived wrong choices I’ve made. It is important to have goals and a path to follow but don’t forget to live a little along the way and don’t let bumps in the road phase you, the bumps are often the best lessons. Still feeling uncertain? We asked around the rest of the office to gather the best advice we could. See something helpful? Please share this with anyone who might benefit from a little pep talk today after receiving their school exam results! 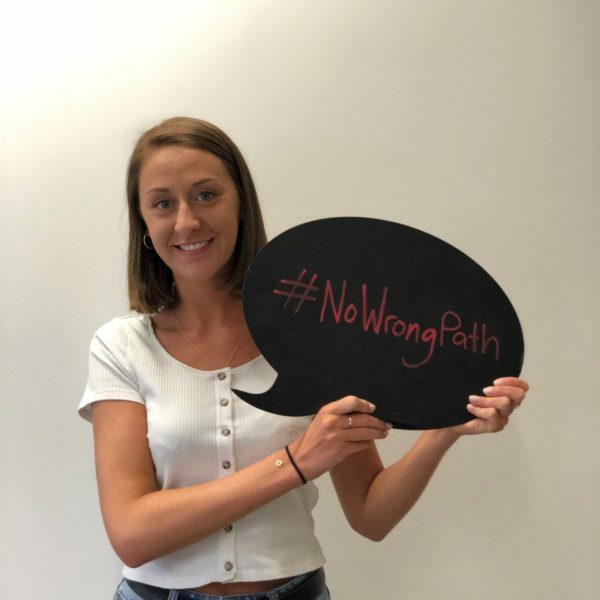 Kristen: Book an appointment with your careers advisor or chat to your parents, teachers or peers – they can often think of things you’ve not considered. I was feeling lost after deciding against studying music, but a friend suggested a media or journalism course. Turned out to be the best thing I could have done. Ash: Google apprenticeships in your local area – it can be a great way to earn while you learn and work your way up in an industry. Madeleine: Consider work experience or internships in a field you’re interested in – it’s a great way to road-test your area of interest before undertaking a university course or seeking a full-time role. As Ross said, experience is the key in any job.